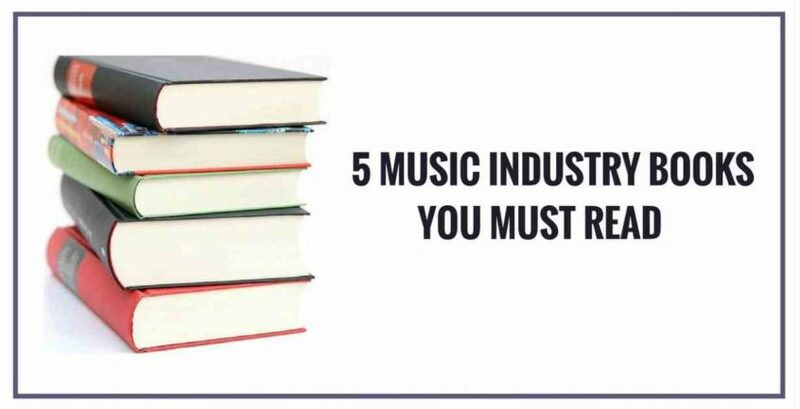 Does anybody really have the patience to read 5 music industry books? Make the time to read the good ones. I’ve already weeded out the time wasters. It’s important to understand the nuances of the music industry, but it’s more important to understand timeless business wisdom and some fresh tactics. 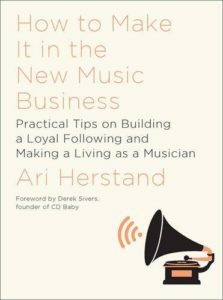 I recommend three music industry books and the final two are actually better business books. They cover crucial business wisdom that the music industry books don’t touch on. When choosing books about the music industry I found this quote from CD Baby founder Derek Sivers very helpful. This list of books won’t bore you with theory. 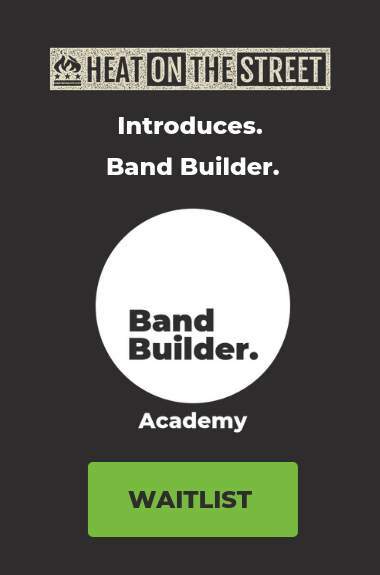 They will give you specific tactics on how to build a fanbase and attract the music industry. All the industry knowledge in the world won’t help you build a fanbase. After you read, you have to take action. Don’t read too much. It’s better to make things happen than theorize about it. 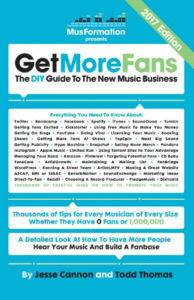 Get More Fans is like asking your favorite band to reveal every step they took on their path to success. These guys are doers. Musicians, engineers (under Steve Evetts, Ross Robinson, and Alan Douches), managed Man Overboard, podcasters (Off The Record), label staff (Go Kart Records), educators, and writers. I like the book because it puts the focus where it should be, on taking action, and not waiting around for somebody else to build your fanbase for you. If there is a negative, it’s long winded. To be fair, most of these music industry books are 300-500 pages. But that’s why they are books and not blog posts. Think of it as buying these author’s “Album instead of streaming a track. For my next recommendation I wanted to have a step by step book. For the price, this one offers the most actionable and valuable information, in my opinion. Too many of these business books can overwhelm you, but this one sticks to the concepts you really need to focus on. Ari’s is an easy read, spot on, and he’s not talking down to you. He’s very musician friendly, because he is one himself. If there is a downside for me, he’s a Dave Matthew’s Band fan…boooooo. But all kidding and personal taste aside, Ari has my full respect and I think will earn yours as well. 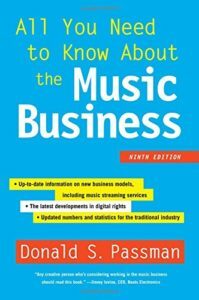 If you need answers to technical questions about the music industry, legendary music attorney Donald Passman has been breaking them down for us since 1991. Now in it’s 10th edition, this is still the top selling music industry book and known as the “bible” of the industry. It breaks down in relatively easy-to-follow language; recording contracts, licensing, management deals, show contracts, digital and streaming royalties, publishing, and many other topics. As I was learning about the music business I had this book by my side as a reference. Fair warning that It’s not an entertaining read, it’s more of a reference book. But I definitely recommend owning it. If I could recommend one book to my 20 year old self it would be this one. Al and Jack will open your eyes to how brands steer consumers (or fans) into choosing them over the competition. It’s a page turner and each of the 22 laws are eye opening. 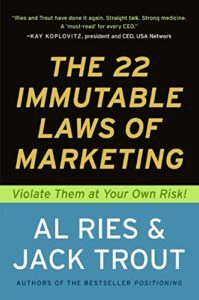 This is one of the all time best sellers in business books and their definition of marketing is one of the most quoted. “Marketing is a battle of perceptions”. The authors give you memorable examples of real companies succeeding or failing based on whether or not they followed the law. Because this book was published in the late 1990’s and the information is pre-internet. Many of the specific company examples are out of date, but the principles are timeless. Gary Vee is everywhere these days, and there is a reason. He has some very unique ideas on developing your brand, communicating with your audience, and execution. 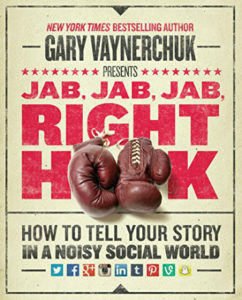 This was initially meant to be social media strategy book, but Gary’s formula of providing great content, hustling, and communicating with your audience have made it a top selling business book. 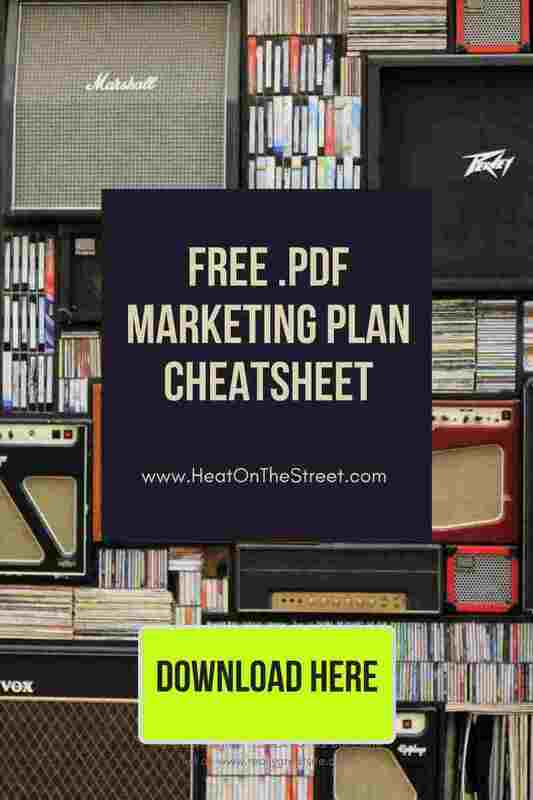 You’ll find tons of social media strategies and a playbook for how to build your fanbase. I wrote the book myself, and it’s basically a mix between my own 10 years experiences from working in the music business, plus practical information on how to promote your music online. You may want to look into it some day!